The Gawler Garden and Produce Share, started in May 2013, and was always intended to be self sustaining, and we think we’ve done a pretty good job of that. The idea was to keep it simple, and open to who ever wanted to be a part of it, while also not needing people to commit to things like keeping records of memberships, keeping and obtaining keys, and setting and packing up. Some people might wonder how we managed to get such a successful “fruit and veg swap” happening and keep it running, well the secret is……we don’t have any secret, apart from “keep it simple and easy”. 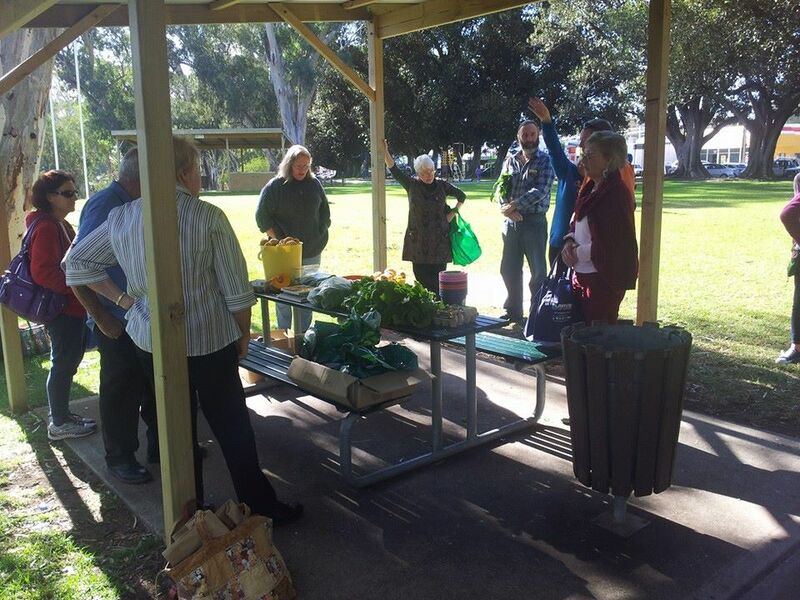 It all started on the Transition Gawler Chat Group when a few people got talking about the idea of starting up a fruit and veg swap, and decided to give it a go….and it actually worked!!! After looking into a few other “Fruit and Veg Swaps” that were happening around the place, and were already quite successful, we decided that we didn’t want to have to deal with fees, or memberships, or needing anyone to commit to attending every single “event” (we all have our own lives and families, and sometimes other things take priority) so we based it along the same lines as the Community Fruit and Vege Swap, which already existed at West Croydon, South Australia. We wanted the meeting place to be in an easily accessible, public place (no need for keys or making bookings) which could cater for a few people or a bigger crowd, so we decided on Apex Park, where it ran for several years, but is now at Pioneer Park, at the benches just near the rotunda. Because we couldn’t guarantee, each of us could be at each event, we wanted to keep things simple and pretty self explanatory, so hence came the name “Gawler Garden and Produce Share“. Swapping or trading wasn’t necessary, as it was all about “sharing” and anything related to “garden” or “produce” was welcome. If what you bring doesn’t get taken by others you are responsible for taking it home. It is a “Share” so no trading or swapping occurs, you bring what you have as excess and take what you can use. You don’t have to have bring anything to be part of the share, whether that is because there isn’t much happening in your garden, or you are new to gardening. We welcome anyone who is interested, especially people just starting out, and feel that over time what you give and take evens out. And that is how the Gawler Garden and Produce Share came to be. If you are interested in starting a “Fruit and Veg Swap” (or a “Garden and Produce Share) in your local area we recommend you give it a go. If you have any questions feel free to Contact us.